Nelly celebrated his 34th birthday with dinner in the private dining room at LAVO restaurant inside The Palazzo Sunday evening. 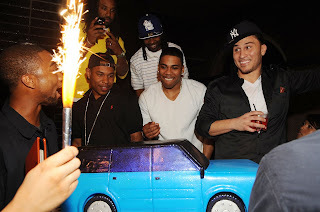 Dinner was followed by a visit upstairs to the nightclub where he was presented with a cake resembling a Ford Flex. Just prior to dinner, the Grammy Award winning recording artist and actor was surprised with a gift of a Ford Flex that he helped customize. Arriving at the same time was boxer Vernon Forrest, prompting Nelly to joke that he hoped never to be on the wrong side of that punch. Spotted in Nelly’s group of friends was rapper Murphy Lee, of the St. Lunatics hip hop group. Kevin Federline took in the sounds of DJ Vice upstairs in the nightclub as well. In a great mood, he danced the night away and laughed and joked with everyone nearby. Several times he even jumped into the booth with DJ Vice to partake in shots of Patron. SATURDAY NIGHT AT TAO AND LAVO! PRINCE SURPRISES CROWD AT THE QTIP CONCERT! BEACHER HOSTS THE INSANITY BALL 2 AT TAO! TERA PATRICK HOSTS HALLOWEEN AT TAO!